Unless you purchase a high-end vehicle–and even often when you do–the factory stereo system is going to sound a bit subpar. Thankfully, there are as many options on the market to rectify this problem, as there are vehicles. Unfortunately, that means figuring out which option is the best for you can be a daunting task, confusing and time-consuming. That is why we have scoured the internet in search of the best components necessary to get your factory stereo system from mediocre to magnificent. For this article, we have put together a list of the best 4 channel amplifiers. Then, we provide a thorough buyer’s guide, so you can feel confident that you are making and informed choice. What is the Best 4 Channel Amp in April 2019? Our first product comes from Alpine, a brand that has been making top-quality audio equipment for decades. In fact, Alpine is the only brand on our list to capture two spots. 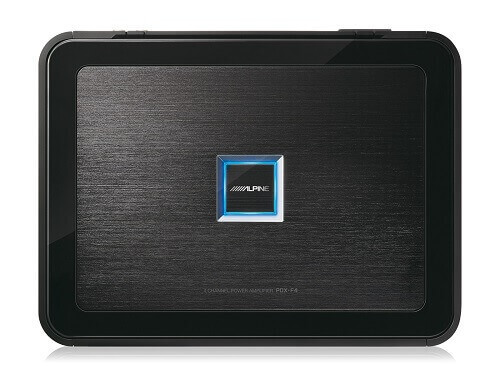 For this amp, Alpine has put out the best 4 channel car amp for the front door speakers and rear acoustic. Keep in mind though, there are some strict limitations if you intend to use this amp for your subwoofer. This amp will not put out the maximum RMS watts for a bridged 2 channel output. With a crossover frequency range of 50 to 400 Hz, more of the lower sounds will be directed to your woofer or subwoofer than with most of the other amps on our list, but the power of the subwoofer need no more 100W. Moreover, this amps features an excellent THD that can get as low as 0.03 percent, depending on your configuration–though running a 4 channel configuration will bump that up to the more standard 1 percent. Still, with a fairly compact profile and a D class circuitry, heat and power consumption will not be much of a problem. What may be a problem, however, is the background noise which is fairly low at 81 dB. All in all, this will still produce the best performance for good sound for the buck, but the buck is a bit high all things considered. While Rockford may not have the same legacy status as Alpine or Kenwood, it is a company known in the automotive audio world for producing some of the best gear available. In this amp, we find that Rockford has once again accomplished this feat, but has even gone the extra mile by making a product that can work with a much wider range of other hardware than most of the brands on this list. Specifically, the Rockford can accept input from far more sources than most amps with an input sensitivity that ranges from 150 mV all the way up to 12 volts. This is generally about 50 mV lower and 2 volts higher than the next closest competitor. If for some reason you have an 8-track, this is the amp for you. However, as per their reputation, the Rockford also produces a high-quality soundscape and this AB class amp is suitable 4 channel amp for sound quality. First, the S/N ratio on this amp is above average with a 150/85 dB, depending on your setup–though, 85 is more accurate for most modern standards. Moreover, if you are running powerful 2 ohm speakers, this amp will push 150 watts through each channel. Unfortunately, if your speakers are 4 ohms, this amp will not perform as well and will only push 75 watts per channel. Moreover, this amp will take a big bite in more than one way. First, it is one of the more expensive amps on our list, and it is one of the larger. However, it has easy to use controls. JL Audio may not have some of the same cache as a couple of the other brands on our list, but they are still well-known and well-respected within the automotive audio market. In this instance, JL Audio has put forth an amp that is ideal for being used as a single piece in a multi-amp setup. The JL Audio accomplishes this with a feature not seen on many of the other entries on our list: preamp outputs. With a 4 volt preamp output, you can run the signal from the JL Audio for your 4 channel 6×9 setup into a second amp for a subwoofer. While the first Alpine on our list can run a sub competently, it will not blow anyone away–figuratively or literally. In fact, if you want to run an impressive system with a powerful subwoofer, we recommend you get a dedicated amp for that purpose. In the meantime, the JL Audio is great to run your more pedestrian 6x9s. Moreover, it can push some impressive power to those speakers with 70 watts RMS for 4 ohms or 100 watts RMS for 2 ohms. Moreover, the small profile makes it easy to put this amp almost anywhere, leaving plenty of room for your larger amp. Unfortunately, the soundscape is a bit poorer than one would prefer. With a sensitivity of 93/73 dB, this is one of the noisier amps on our list. Kicker does not get the same respect as some of the other brands on our list, and to be honest, it does not truly deserve it. That is not to suggest that the Kicker is a poor product. Still, this amp wins in one area and that is best 4 channel amp for the money. While not strictly the least expensive amp on our list, it does come pretty close. Moreover, it is distinctly better than the absolute least expensive amp on our list. In fact, its S/N ratio of 95 dB is actually pretty good–surprisingly good at this price point. 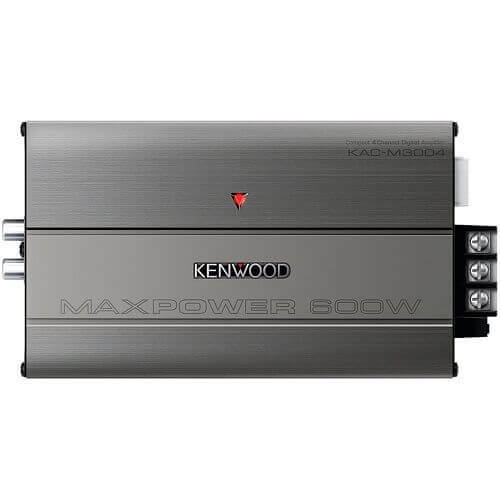 Moreover, with an input sensitivity range of 125 mV to 10 V, this amp is great at running legacy head units. 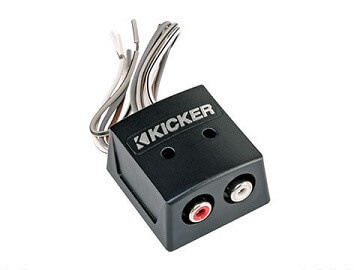 Unfortunately, Kicker is one of the larger amps on our list, which makes finding a location for it more difficult but has efficient heat sinks to cool. Finally, the RMS wattage, whether 4 ohms or 2 ohms, is one of the lowest on our list. Outside of Alpine, Kenwood is the other legacy brand on our list and have been producing top quality automotive audio equipment for decades. In recent years the company has lost some of its lusters, but it still manages to find niches in the market that are underserved. Case in point, this is the best amp on our list for motorcycle. This is the amp on our list that has very very compact size and has switchable, adjustable crossovers. It can also do this for either a 4 channel or a 2 channel bridged configuration. Moreover, the Kenwood takes the smallest bites in a couple of places. First, this is the absolutely least expensive product on our list while also coming in at the smallest profile. Sadly, this amp suffers from noise issues as the S/N ratio is a substandard 76 dB. In fact, the whole soundscape is a bit limited. First, the frequency range is a tad low at 20 Hz to 20 kHz. However, it is the low RMS wattage of 75 at 2 ohms and 50 at 4 ohms that really stands out. Much like Rockford, MTX is not the most well-known brand out of the products on our list. However, just like Rockford, this brand has also made a name for itself by producing high-quality audio systems, though often for a more reasonable price. Consequently, that is the case here, as the Thunder series 4 channel amp captures our best all-around value slot. First, this amp pushes plenty of power with 100 watts RMS at 2 ohms and an impressive 75 watts RMS at 4 ohms. Moreover, this amp features one of the best soundscapes with a frequency range of 15 Hz to 25 kHz–that is about 5 Hz lower than average and 5 kHz higher than average. Finally, this is only one of two amps on our list, the other the best performing Alpine, to feature a THD below 1 percent. However, you get what you pay for, and with the MTX, you will have to pay for this quality as it is a fairly expensive amp. Finally, much like the first AB class amp on our list, the MTX will also produce a lot of heat which may limit where you can put it. As has been established, Alpine is a high-end brand in the automotive audio market. That is why it should come as no surprise that the PDX-F4 is the top performing amp on our list. In fact, this is actually a better amp for many of the niches that other amps take the title for. However, this is also by and far the most expensive amp on our list. As such, if you are purchasing an amp for a niche purpose, it is probably a better idea to get a solid amp at a more reasonable price. However, if you simply want the best performance and will spare no expense, then this is the amp for you. First, this amp pushes 100 watts of RMS power through any impedance. This is actually the only amp on our list capable of doing so. Moreover, the soundscape of the PDX-F4 is by far the broadest with an astounding 5 Hz to 100 kHz frequency range. No other amp on our list comes anywhere near that value. In another best, the PDX-F4 also has the least amount of noise at 115/95 dB and ties for first with the MTX with THD of 0.05 percent. The only real downsides are versatility. This is one of the larger amps on our list–though it is a class D topology, so heat will not be a problem. Also, the input sensitivity is a bit narrow at 400 mV to 4 volts which will necessitate newer head units or signal transmitters–a small price to pay for such a quality amp. This is a device which receives an electrical signal and, as the name implies, amplifies that signal. It then sends that signal along its channels to be received by speakers, whether 6x9s, dedicated tweeters, or subwoofers. A 4 channel amp is and amplifier that puts out equal power to all 4 channels. However, some 4 channels amps have the ability to combine the power from multiple channels via a process called bridging. Keep in mind, while bridging 2 channels will often double the amp’s output, this is not always the case–especially among lower quality amps. A 4 channel amp is generally used to power either 4 speakers–often 6x9s + front speakers–or 2 front speakers and a subwoofer with 2 channels bridged. Of course, if you want to power all four speakers as well as the subwoofer then you will either need to get a 5 channel amp or, more likely, purchase a separate amp for the subwoofer. You can wiring speakers in parallel, but the resistance of the speaker’s decreases and you need to pay attention to amplifier impedance ratio. Granted, it is entirely possible to power 2 standard 6×9 speakers with a 2 channel amp. However, 2 channel amps are not really designed for this purpose. Instead, a 2 channel amp will generally put out more RMS wattage through each of its channels. This additional power serves the 2 channel amp’s true purpose: to push the bass. Instead of simply powering two standard speakers, a 2 channel amp will often be used to power one or two subwoofers instead. Keep in mind, it is not altogether uncommon for an automotive audio system to make use of both a 4 channel amp as well as a 2 channel amp. 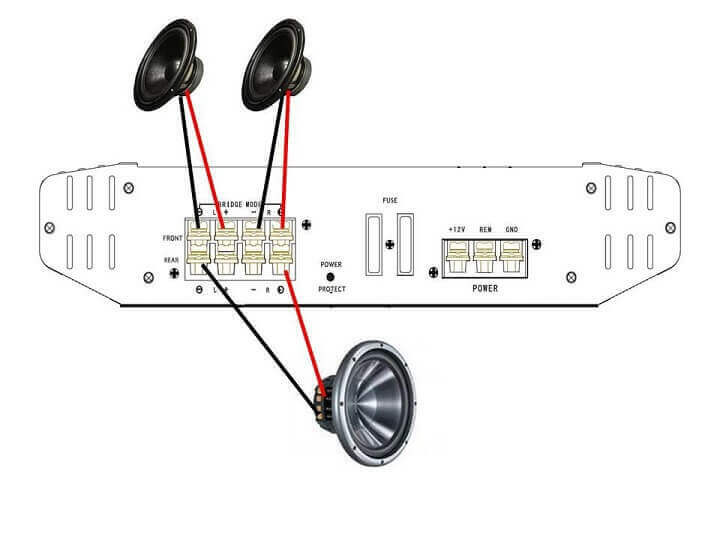 The former will power the speakers, while the latter powers the subwoofer or subwoofers. These two wattage values will determine the power that your amp can push to the speaker system. However, Peak is generally used as a marketing ploy with RMS being the more important of the two. RMS wattage relates to the power that can be pushed at a constant rate through each channel, while peak wattage refers more to the maximum wattage the amp can push in a single burst. For RMS wattage, there will often be two or more different values depending on the impedance of the speaker. Generally, the higher the impedance, the lower the RMS wattage per channel. However, there are a few amps which push the same amount of wattage per channel, regardless the impedance. While impedance is not necessarily a quality concerning the amp exclusively, it is still one of the more important aspects of your speaker system for producing the best audio quality. Your speakers will have their own impedance rating. Whatever the speaker impedance rating, the amp needs to be able to push power through its channels at that omhs. The size of the amp’s fuse will determine whether or not the amp can actually produce the continuous wattage it advertises. The formula for this is to multiple the watts out by 2 then divide by the car battery. For example, if an amp puts out 250 watts, you first multiple that by 2–the numbers of watts coming in. Then you divide that by the car battery’s voltage, usually 14.4 volts. This gives you 35 amperage. If the amplifier does not use fuses with at least a 35 amperage rating, the amplifier will not be able to constantly push all 250 watts. In terms of input plugs, most factory head units don’t have preamp outputs (RCA). If the amp can receive a speaker level signal, the head unit does not matter. However, if the amp can only receive a preamp signal, then the head unit will need to add line-out converter. This refers to the “topology” of the amplifier’s architecture. While there are technically 4 types of amplifier topology, you will most commonly run across two within automotive audio systems: AB and D class. AB Class has a tendency to produce better sound quality. However, even many audiophiles will acknowledge the difference is generally negligible if you can even pick it out. This topology also produces far more heat than the D Class. For a D Class topology, the high frequency reproduction is technically inferior–though the registers are usually beyond a point of meaningful distinction. However, the D Class is much more energy efficient and produces less heat. The difference between the AB and D Class high frequency registers may have been more pronounced at one time, but it is generally accepted as a minimal difference in modern amps. However, the energy consumption and heat output remain a big difference. As such, people often opt for D Class amps. There are a few features and factors that will ultimately impact the best sound quality your amp can provides. Some of these include filters, frequency response, sensitivity, sound-to-noise Ratio, and total harmonic distortion, or THD. All of these affect different qualities of the soundscape, and depending on what you are listening to, some will be more important than others. Filters – There are 3 filters used, two of which are found on most decent amps and one that is a bit specialized. The two filters found on most amps will be high pass and low pass. If a signal is not high pitched, running along a lower but still medium level range, the low pass filter (LPF) will only send that signal to channels running speakers which will play that frequency–often the midbass or subwoofer. Conversely, a high pass fade (HPF) will filter out the higher frequency signals and only send them to speakers designed to play the higher frequency registers–usually the tweeters and super tweeters. Frequency Response – This quality determines the maximum range of frequency signals the amp can push. The higher the number, the broader the soundscape. However, this can be a bit misleading as many of the highest and lowest frequencies are inaudible to the human ear, only response of 20 to 20,000 Hz. Once a frequency is too low, it enters the subharmonic stage–though, these frequencies can often still be felt. Likewise, once a frequency gets too high, it enters the superharmonic phase, but superharmonic frequencies are generally not only inaudible but can not be felt either. THD – Total Harmonic Distortion determines how accurately the amp replicates the input signal as it pushes it through to the speakers. The lower this value the better. Essentially, as the signal reaches the amp and is decoded to then be pushed at a higher power to the speakers, the signal can become modulated and distorted. Better amps will have the lowest THD and more accurately reproduce the signal at higher power values. Beware an amp with a THD above 3 percent as you will start to notice the difference in sound quality, and the actual sounds will be different than on a better system. Sound-to-Noise Ratio or S/N, is a value which determines how much “noise” or interference the signal carries through the amp and is measured in decibels. The higher this number the better. Older amps were often large, heavy slabs that generated a great deal of heat and needed a lot of open room to disperse that heat. As technology advances, we have become more adept at miniaturizing amps so that they can fit in smaller and smaller places. However, that does not prevent the amp from still generating a considerable amount of heat. As such, the size of the amp will limit and determine where you can place it. Smaller amps can often be placed under a seat and still have access to enough airflow to remain at an equilibrium. If you have the disposable income, there really is nowhere else to go except the Alpine PDX-F4. In fact, this amp is so good that it is often better than the other amps on our list at their titled function. Granted, this is not for every case, but it happens often enough that it makes this the best amp on our list. However, if you are not looking to pay at least 50 percent more above the asking price of every other option, there are still plenty of amps that can more than satisfy your needs. If you need a budget amp, for instance, the Kicker CXA300.4 is a great amp that has a wide range of versatility to suit more configurations than most. 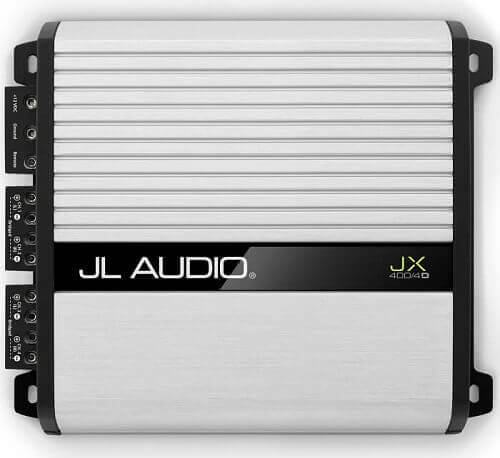 If you intend to run an amp for your speakers and an amp for your subwoofer–which we highly recommend–then the JL Audio JX400/4D is where you should look. 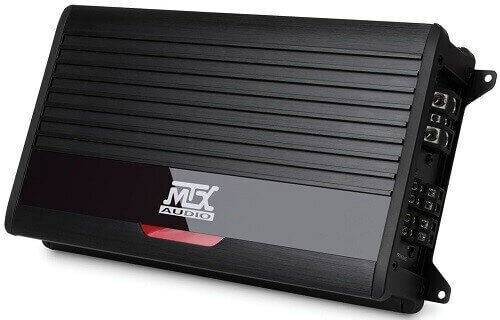 Of course, if you just want one amp to rule them all, it is hard to wrong with the Alpine MRV-F300. Regardless, there is an amp that can fit your needs on this list no matter what they are. Moreover, with the help of our comprehensive buyer’s guide, you are not able to look at the amps, both on our list and not, and make an informed choice for yourself. I'm a 28-year-old car audio enthusiast. I've been an audiophile since my teenage years. Experienced in speakers, subs, and amplifiers installation. How many rca cables for 4 channel amp needed? Thanks advance. You’ll need 2 pair stereo RCA cables. – You can connect single RCA cable to the back of your head unit and at the other end use 2 Y-splitters but fade will don’t work. Some posts may contain affiliate links. soundrating.com is a participant in the Amazon Services LLC Associates Program, an affiliate advertising program designed to provide a means for sites to earn advertising fees by advertising and linking to Amazon.com.